“All instructors and TAs and class material lived up to the hype made by my boss and coworkers. Appreciated the approachability of all and patience. Thank you!" 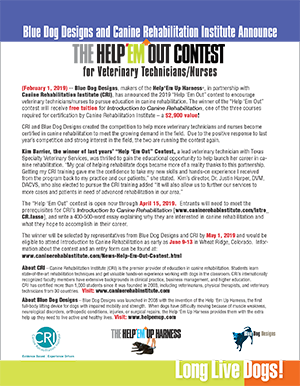 Blue Dog Designs, makers of the Help‘Em Up Harness®, in partnership with Canine Rehabilitation Institute (CRI), has announced the 2019 “Help ‘Em Out” contest to encourage veterinary technicians/nurses to pursue education in canine rehabilitation. The winner of the “Help ‘Em Out” contest will receive free tuition for Introduction to Canine Rehabilitation, one of the three courses required for certification by Canine Rehabilitation Institute – a $2,900 value! CRI and Blue Dog Designs created the competition to help more veterinary technicians and nurses become certified in canine rehabilitation to meet the growing demand in the field. Due to the positive response to last year’s competition and strong interest in the field, the two are running the contest again. The “Help ‘Em Out” contest is open now through April 15, 2019. Entrants will need to meet the prerequisites for CRI’s Introduction to Canine Rehabilitation, and write a 400-500-word essay explaining why they are interested in canine rehabilitation and what they hope to accomplish in their career. The winner will be selected by representatives from Blue Dog Designs and CRI by May 1, 2019 and would be eligible to attend Introduction to Canine Rehabilitation as early as June 9-13 in Wheat Ridge, Colorado. To qualify for the contest, entrants must have successfully completed an approved veterinary technician program and must be able to provide proof of licensure, registration, or certification in the state where employed. Entrants must be employed by a practice where there is a veterinarian or physical therapist certified in canine rehabilitation or registered for Introduction to Canine Rehabilitation. The contest is open to new Canine Rehabilitation Institute students only. The contest entry form is available now through April 15, 2019. Please complete the form below to enter.